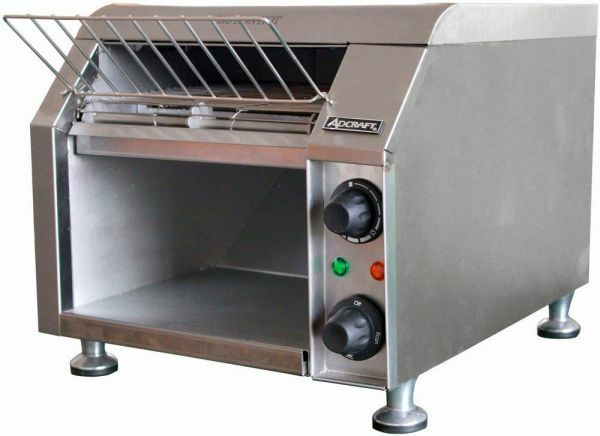 A great appliance for use in restaurants, banquets, buffet lines, hotels or any other establishment with a commercial kitchen, this N.S.F.-approved conveyor toaster from Adcraft (model CVYT-120) will crank out between 280-300 slices of perfectly toasted bread per hour. 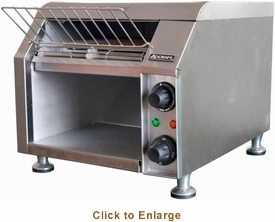 The toaster is entirely constructed of high-quality stainless steel and the unit's easy-to-set controls allow for the choice of single or both-sides toasting; the stainless steel 10� conveyor belt is adjustable. (Varying the speed of the belt will adjust the degree of toasting, of course.) The unit�s crumb tray comes out easily for cleaning. With 1700 Watts of toasting power this compact toaster runs on standard 120V/60Hz wall current and would be great fit for any busy food service operation.